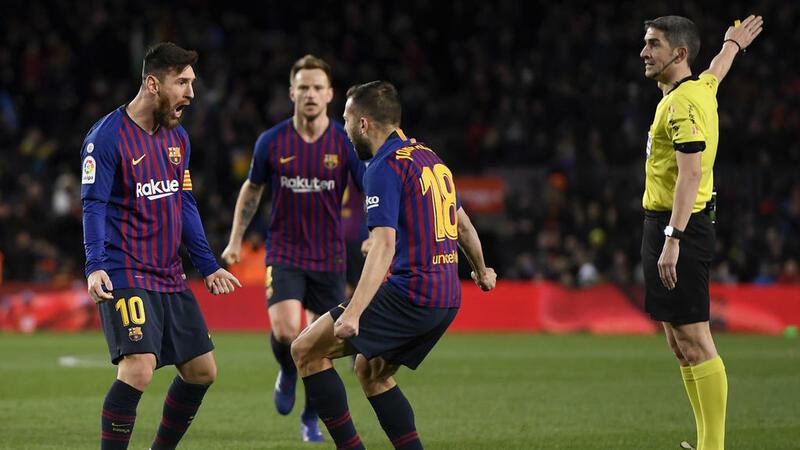 Lionel Messi scored for a ninth consecutive match, but his latest double on Saturday was only enough to earn Barcelona a 2-2 draw against Valencia. Kevin Gameiro and Dani Parejo's penalty gave Valencia a surprise two-goal lead but Messi pulled one back with his own spot-kick before curling in a brilliant equaliser with 26 minutes left. After their stunning comeback against Sevilla in midweek, Barca looked destined to again finish the job, but Valencia held on for a point after a breathless contest at the Camp Nou. Messi's 20th and 21st league goals of the season left Barca six points clear of Atletico Madrid, who could cut the gap to three by beating Real Betis on Sunday, with Real Madrid, 11 points back, at home to Alaves. After eight consecutive Barcelona wins in La Liga, this result perhaps offered the chasing pack a little encouragement at the start of a testing month for the Catalans. Real could inflict further disruption themselves. They play Barca in the first leg of the Copa del Rey semi-finals on Wednesday, in what will be the first of three Clasicos in a month. The latter two will be back-to-back, within four days. But with Messi in this sort of form, any confidence from Real comes with an asterisk. The visitors rode their luck as two decisions went their way in a matter of minutes. First, Barca could have had a penalty when Gabriel Paulista blocked Nelson Semedo's shot with his hand. Rodrigo carried the ball 40 yards before slipping a cute reverse pass behind Vermaelen. Gameiro banged in the finish. Valencia's penalty was clear after Sergi shoved Daniel Wass in the back, with Parejo whipping the ball into the corner to make it two. Barca looked shell-shocked but the third goal in 15 minutes was theirs. Semedo beat Toni Lato to Arturo Vidal's pass and tumbled after a clip on his shin. Messi slammed the loose ball into the top corner but the whistle had blown. He rolled in the penalty instead. Sergi's shot crashed against the post and Barca were dominant after half-time. Messi and Carles Alena had shots saved, and Messi headed over. At the other end, on a rare Valencia break, Rodrigo should have made it three but, on the stretch, put it over from six yards.